The Faith Longhorn Volleyball Team talks things over during their match with Northwestern Friday night. SIOUX FALLS, S.D. 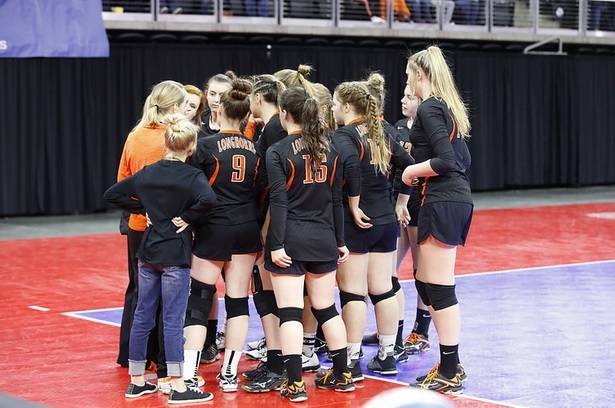 - After a remarkable comeback to beat Faulkton Thursday, Northwestern was too much for the Faith Longhorns in Friday night's semi-finals. Faith played the top seeded Wildcats extremely well, but dropped three straight sets, 16-25, 18-25 and 22-25. Faith got a great game from Sydnie Schauer, who scored 9 digs. Mikenzy Miller added 9 kills on the attack for Faith. Northwestern was led by Madalyn Groft and Tya Wiedemann's 14 digs each. Riley Grandpre added 15 kills. Faith will play Chester Area on Saturday for third place. Northwestern will play Warner for the Championship.